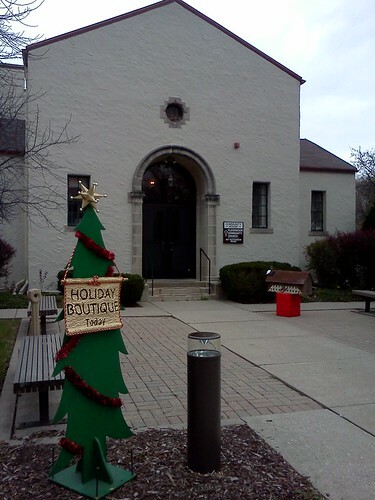 Posted on November 13, 2012	by Alice C.
On Saturday, November 3, I attended the Quilter’s Plus Holiday Boutique at the Flossmoor Community Church Community House. Quilter’s Pus is an active local quilting guild, and there was a lot of talent on display at their annual holiday craft show. 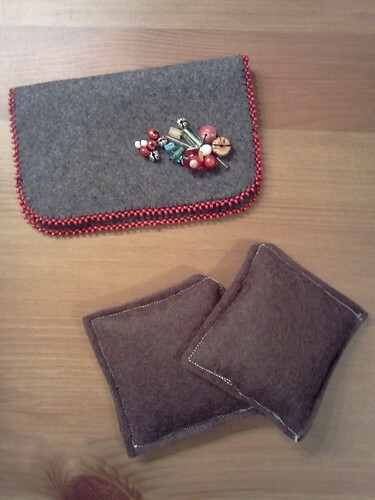 The top item is a beautiful felt business card holder with beaded embellishment. And, the pair of brown felt pillows at the bottom are pocket warmers. The pillows are filled with rice, and you just pop them in the microwave for 30 seconds to a minute, and they get nice a toasty to warm your hands. I’ve been using the pocket warmers quite a bit in the past week, and they work wonderfully. My hands are always cold, so I’ve been using them even when I’m just sitting at home. I did not take any photos inside the building, but, fortunately, there are dozens of photos from the holiday boutique now posted on the Quilter’s Plus website. This entry was posted in Personal and tagged crafts, personal. Bookmark the permalink.